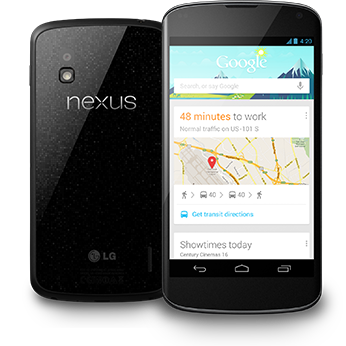 When I got my Google Nexus 4, I was very happy. Like a child who gets a new toy, I excitedly opened the packing and immediately starting setting up stuff. I made sure I got all my contacts from my iPhone over. I setup my email and all the other accounts. I started getting a few apps as well - things I would obviously need - Facebook, Twitter, Evernote etc. One thing that struck me immediately was that it was difficult for me to find my way around the phone. The whole thing was confusing. There were apps and widgets and you could have both on the same screen. Then you had a screen where you had all your apps and there was a tab for Widgets. The widgets tab had multiple widgets for each application. I was not used to so much stuff. My iPhone kept things very clean. Then I had my first brush with frustration. I thought I should change the desktop picture. The default one was a little weird. I went to the Settings and chose the image I wanted. Then came trouble. Over the image were two overlapping rectangular boxes with handles. I could tell that it was allowing me to crop the image. But I couldn't, for the life of me, figure out why there were two overlapping boxes. Try as much as I could, I did not manage to get the image I wanted as my background. It would either be much too zoomed out or would have the wrong part of the picture as the Desktop. I then checked online about this and found that people had recommended an app to do this easily. I got the app and Voila! I could set my image as desired as the Desktop. It was then that I realized how things worked in this world. Nothing much came by default. You figured out what you wanted and got an app for that. There would be an app for almost every imaginable need. The overall experience with the phone, however, was clunky, to be honest. For example, you are supposed to be able to access the Settings by swiping with two fingers down. Many times, I would swipe with two fingers but it would assume a one-finger swipe and this would show the notifications screen. Many such publicized gestures did not work all the time. I would need to do the gesture 2-3 times before they would work. The default way music and pictures were stored and accessed was also very clunky. To play music, I had to select a playlist and then "add to a queue". I was like, "Play the damn thing NOW!" One big problem I have with the Nexus 4 is its width. I cannot hold it comfortably in one hand and use it. This is important for me when I get on to dialysis and am about to get off dialysis as well. Since only one hand is available, I don't have the luxury of using two hands to operate the phone. This makes it very difficult to use the Nexus 4 at these times. But again, this is only me! One thing I absolutely loved about phone was the swipe keyboard. This was fantastic and made typing a breeze. Another thing which I discovered was Google Now. This was a fancy little app that was fun to play with. If it becomes more reliable and consistent, it could really be much more useful. It could be possible that I have gone just too used to the iPhone and the entire Apple eco-system to take change easily. I know people who swear by the Nexus 4, many of them previous iPhone lovers. So, I guess this is a very personal thing. A lot could also depend on the things you use your phone for. I am not a very advanced user. I use the phone for basic stuff. Phone calls, text messages, few apps. That's it. For my usage patterns and circumstances, one phone could be better. For another person, another phone could be better. To each, they say, his own!